American Idol has changed its format. The contestants will be split into two groups of 12, one performing this week, the others next. Each singer will perform solo on Wednesday and with a previous Idol contestant on Thursday. The judges will then send five contestants home each week, leaving us with a top 14. There is no indication on how the 24 were split in two, but something tells me this was an easy way for producers to get rid of some contestants… But I digress. Here is my ranking for the first group of twelve, from worst to best. Jordan Sasser debuted his new short do while singing “All By Myself.” There was absolutely nothing good about his performance. He was pitchy, shout-y, bad, bad, and awful. On top of that, he was too dramatic. I think we will finally say bye to Jordan to this week. Emily Brooke did something that I thought would be a no no and went with a song by a winner of The Voice, Cassadee Pope’s “I Am Invincible.” She was flat throughout the entire song, which was probably an octave lower than her voice could handle. It was a bit of a disaster, and the judges agree. Stephany Negrete started the show with Jessie J’s “Mama Knows Best.” She’s beautiful, has a strong voice, and dang I was impressed with all her squatting in those sky high heels. But Harry put it best when he said “Its like connecting the dots… there was something missing.” Jennifer mentioned that she needs to listen to the words and connect, which seems to be a reoccurring problem this season. Jeneve Rose Mitchell, what am I going to do with you? She sang Sarah McLachlan’s “Angel,” while playing a harp, which is impressive. I’m still not understanding her appeal. She sounded better than she has, and I enjoyed her vibrato in certain places, but it seemed as though she couldn’t find her pocket. She was singing too fast, and then too slow. Harry told her she did herself a disservice by playing the harp, but Keith and Jennifer loved it, despite Jennifer’s original hesitations. James VIII gave Kanye West’s “Love Lockdown” a bluesy feel, which would be great sitting at a lounge in Los Angeles. There was nothing wrong with the performance. When you’re on American Idol though, you have to show off a bit. All James showed off was his guitar skill. Jenna Renae sang her heart out to “My Church.” The thing is, as I’ve mentioned again and again, there are plenty of good singers in the competition. Am I going to remember this performance tomorrow? Probably not. Harry noted that she came off as shout-y in some parts, and her pitch suffered because of it. I have to agree. If Jenna stays in the competition, she has to start being, well, interesting. Avalon Young chose “Love Yourself” by Justin Bieber. She sounded nasally in certain parts, had a few sharp notes, but her tone is smooth. She didn’t show off any creativity in her arrangement, or in her performance, which the judges didn’t let her forget. But they love her, so she’s probably safe. Sonika Vaid looked terrified and nervous the entire time singing Taylor Swift’s “Safe and Sound.” I’m going to ignore her awful dress, because her voice is beautiful. There were moments where she was a little bit too breathy, but overall, she sounded incredible. Her nerves got the best of her performance wise, and if she stays that’s something she’ll have to work out. Thomas Stringfellow took on “Creep,” and turned down his squeakiness by about 80% from the previous week. His pronunciation is a bit affected, with some words coming off completely unintelligible. He played around with his falsetto, and it paid it off. The only thing that bothers me about Thomas is that he’s so similar to Mackenzie, and Mackenzie just does it better. Gianna Isabella performed “I Put A Spell On You,” and really showed off her vocal ability. Her immaturity showed, though. She didn’t connect to the lyrics at all, and just sort of stood there. The judges agreed, she needs to start digging a bit deeper. 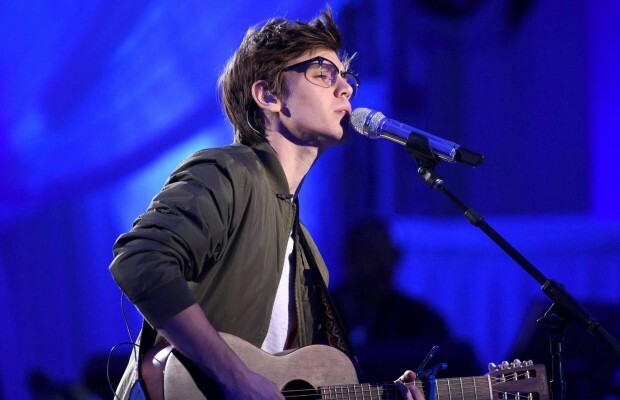 Mackenzie Bourg has looked familiar to me since day one, so I decided to use this fancy thing called Google to see why. (And yeah, okay, maybe I was trying to find age, astrological sign, compatibility with Pisces, if he has a girlfriend, etc.) I quickly learned that he was also on The Voice. He even made it to the live rounds before getting eliminated. So, it’s not surprise that he is killing this competition thing. He sang “Say Something,” which the audience and judges loved. His raspy tone and falsettos are so easy to listen to. Keith said he believed what he was singing. There’s not doubt in my mind he’s making it to next week (well, week after next). La’Porsha Renae… Harry said it best when he told her “I would be foolish to critique that in any way shape or form.” La’Porsha embodied Tina Turner with “Proud Mary.” She could have been over the top but she was just perfect. My one critique, sorry Harry, is that she could have switched up the arrangement somehow to show some artistry, but hey, she was still the best of the night. And even though my bottom five performances are who I think should be going home, I know how this game works. The best are sometimes sent home, and surprises are prevalent. I see the end of the road coming for Jordan Sasser, Emily Brooke, Stephany Negrete, James VIII and Jenna Renae. Next week, the rest of the top 24 take on the same task.